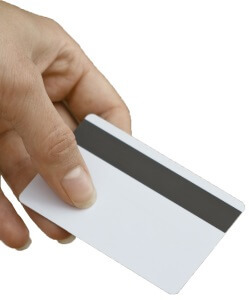 Magnetic stripe cards are a useful and quick way to identify your cardholders to your software package, be it a simple membership database, a Point of Sale system or an Eftpos based CRM system or smart card reader. Additional security can be built in if required, please contact us to discuss your requirements. Magnetic stripes are available either as Hico (High Coercivity) or Loco (Low Coercivity). Hico cards have stronger magnetism than Loco cards and are therefore more robust and less susceptible to accidental erasure of the data which has been encoded. As there is very little price difference between Hico and Loco cards, we recommend Hico to all of our customers. Magnetic stripe cards supplied by Ecardz will carry a Hico 2750 Oe (Oersted) magnetic stripe unless otherwise specified by the customer. Hico 2750 Oe is the standard used by all financial cards and is suitable for cards that need to be swiped through either a Point of Sale terminal or an Eftpos terminal. Our magnetic stripe cards are also 3 track which means they are compatible with 2 and 3 track readers in the field. This also means we can encode for all available Point of Sales systems. If you require a magnetic stripe on your cards, please ensure your artwork allows for this and that all important information is placed away from the magnetic stripe area. Ecardz can supply you with artwork specifications to ensure the magnetic stripe is in the correct place on your design. If you require cards that are swiped through either your Eftpos terminal or a magnetic card reader on your point of sale, Ecardz will encode the cards to suit your software package. If you are launching an Eftpos based program through Ecardz we take care of it all including providing testing services prior to your product launch. If your cards are compatible with your Point of Sale system we will ensure that the encoding on your cards is able to be read by POS. Give us a call today to discuss customization of your ID cards.